Japanese beetles are always present in the Indiana landscape in mid summer, but some years are definitely worse than others. This is one of those years. Are you stumped about how to keep the iridescent pests off of your plants? Today we'll talk about the pros and cons of different strategies. Insecticides are one popular approach because they're the easiest reactive option (we'll deal with prevention later). There are two main caveats with this approach though: not all insecticides are safe for plants you intend to eat if you're trying to protect fruits and vegetables, and insecticides will kill bees and other beneficial insects just as easily as they kill the Japanese beetles. For this reason, it's important to be very careful with the products you pick and your timing in applying them. Insecticides that are safe to be used on food will be labeled that way, and they will also tell you how soon before harvest they can safely be applied. 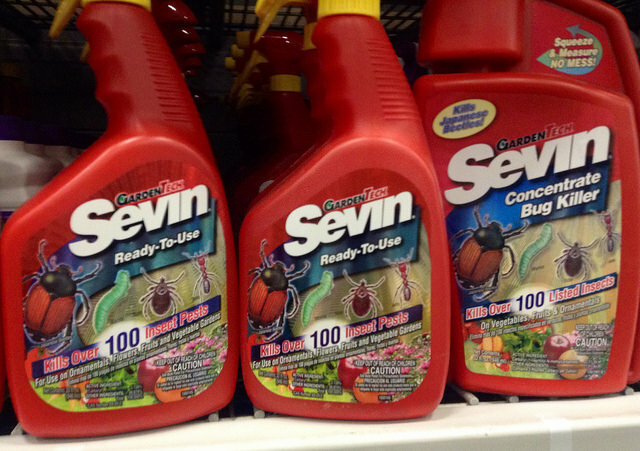 Sevin is one popular product that is safe for food, and for most crops, it can be applied up to a day or two before harvest. If you're looking for something safe for bees, look for a product with Bt (short forBacillus thuringiensis) as the active ingredient. These products are derived from bacteria that kill certain insects, including Japanese beetles. They are also organic, as long as they aren't combined with other synthetic active ingredients. You can also minimize harm to bees by only spraying plants that aren't flowering or by spraying early in the morning or late in the evening when bees are the least active. Keep reading for some more bee-safe battle tactics. There are many insecticides on the market that will kill Japanese beetles, but it's important to know that not all insecticides will work on them. Always check the label to see if the product is recommended for Japanese beetles, and to make sure you know how to apply it safely and effectively. Japanese beetle traps emit a pheromone that attracts the insects and traps them in a bag. They are great for large properties where you can hang them far away from the most vulnerable plants, like roses and apple trees, but on a small property it will just bring the beetles in hordes, and they can easily stop to snack in your garden on their way to the trap. Possibly the most effective way to deal with the pests, and the least harmful to helpful insects, is to deal with them one-on-one, mano-a-mano (or mano-a-whatever beetles have for hands). Japanese beetles are easy to spot, and they're not very fast or very smart. For many gardeners, the preferred way to kill them is by mixing up a bucket of soapy water, holding it under the beetles, and simply knocking them off of the plant and into the soapy water. The soap will kill them, and you can dispose of the bodies in the trash to keep their scent from attracting more beetles. You can also just flick them off or knock them off with a hose, and while this may do well enough for years with low numbers, in a year like this it's really best to finish them off. Japanese beetles can fly to your property from up to a mile away, so these preventative measures aren't foolproof if your neighbors don't adopt them as well, but they can still help. The best preventative measures target the larvae of the beetle - the same grubs that are known for destroying turf. Yes, the white grubs so many homeowners valiantly battle are often Japanese beetle larvae, although some other species also eat grass roots. Next week we'll share a post about how to control grubs in your lawn, so stay tuned! For more information about Japanese beetles, the plants that are most vulnerable to them, and the insecticide products that work best on them, check out this write-up from Purdue University.